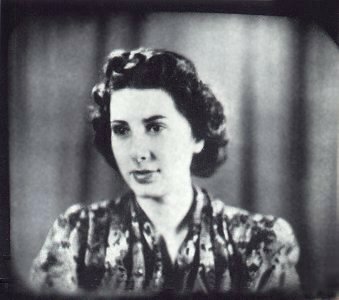 TELEVISION a lifetime ago - how it looked ... An unretouched picture showing BBC hostess Elizabeth Cowell, taken from the television screen in July 1939. 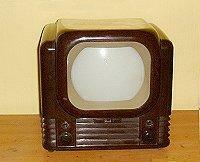 Long a science-fiction dream, TELEVISION was a major technical achievement of the twentieth century. 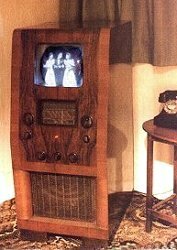 In November 1936, the BBC started the world's first regular high-definition television service from the Alexandra Palace in London. Above left, dating from 1937, we see an example of the Marconiphone 702 with mirror-lid, restored to working order. 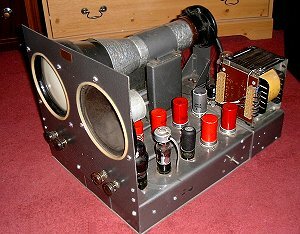 The set on the right, a 1938 HMV 907 with radio, I restored some years ago but is no longer in my collection. Above, on the left you can see a Retrovisor Festival, produced by Radiocraft from 1993 to 1995. In the centre there's an original example of its inspiration - the Bush TV22 which dates from 1950. Finally, on the right there's a Retrovisor Metropolis in operation. Interested in finding out more about the Retrovisor ? Click HERE to take a look at these sets and learn the current supply situation. 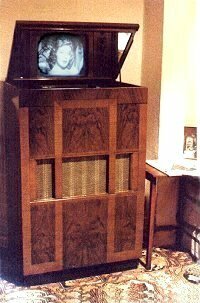 This is the Argus, a 'kit' television I constructed in 1990 from instructions which appeared in a series of Practical Television Magazines in 1952. Billed as a "television for £20" I found this still cost about the same to construct (in real terms allowing for inflation) 38 years later. It uses 1940s-style trf circuitry and ex-WD parts. Although the VCR97 tube originally specified gave a green picture, I was fortunate enough to find a physically-identical CV2810. 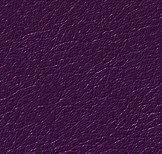 This had a short persistence violet phosphor beneath a longer persistence green one, effectively giving a black & white picture. As the post-war austerity period was drawing to a close, this project allowed the technically-minded amateur to build his own set for an affordable price. Specially designed cabinets for this chassis were also made available at the time. If you'd like to build your own Argus, CLICK HERE for all the original instructions ! SEE THE RANGE OF SETS ON OFFER AT RADIO OLYMPIA 1938. click here ! 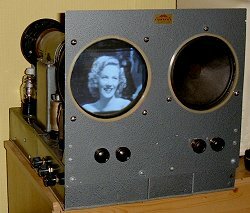 NOW YOU CAN BUILD THE 'ARGUS' TELEVISOR (depicted further up). click here ! 405-LINE TELEVISION TO GO ON THE AIR AGAIN ? click here ! WHAT'S MY TELEVISION WORTH ? 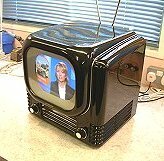 Click here to see an amazing private collection of rare Vintage Televisions. 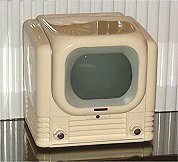 View pre-war British television programmes on your computer screen - as they were seen a lifetime ago ! Here's something different ... 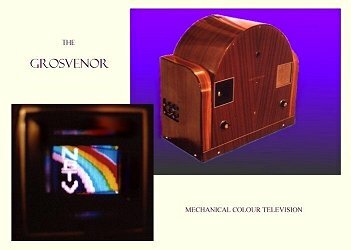 Mechanical Television in Colour!